Recently announced the forming of a day camp for young people interested in aviation. located at Mount Pocono Airport. 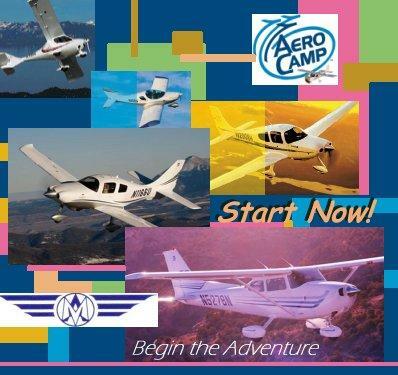 Moyer Aviation started AeroCamp in the summer of 2012. We had great success on our past summer of 2010, 2011, 2012, 2013 & 2014 & 2015 AeroCamp classes and are looking forward to 2016! Call or email us today for dates and details! All summer long - weekly schedules, small or large classes available. - flight in a full motion flight simulator! - Career information discussed and provided for all aspects of the Aviation & Aerospace Industry including; (but not limited to) piloting aircraft, Certified Flight Instructors, Maintenance, ATC (tower) & weather / meterology. For those selecting the flight option session the student will actually fly an airplane on a cross country flight with a certified Flight Instructor and time flown will be logged in your own logbook. Field trips will consist of visits to aircraft maintenance facilities, weather stations, and corporate flight departments. There will be a tour of the Lehigh Valley International airport including the fire and rescue departments, and the airport Control tower. Please call today for more information and pricing for this exciting and very worthwhile program. Contact Vern Moyer at 570 839-7161 / 800-321-5890 or email us! 11:00 am - 12:30 pm Lesson Aircraft flight controls & fundamentals of flight. 3:00 pm - 4:00 pm Lesson Engine startup, taxi, run up and radio use. 10:00 am - 11:00 am Trip Weather Trends International. Learn about weather. 10:30 am - 2:00 pm Trip Flight to two airports. - There will be three students to each aircraft, each student will receive approximately 45 minutes of flight time. Non flying students will ride in back seats. Approx 12:00 pm Lunch ** Each student brings their own. Please call today for more information on this exciting and worthwhile program.